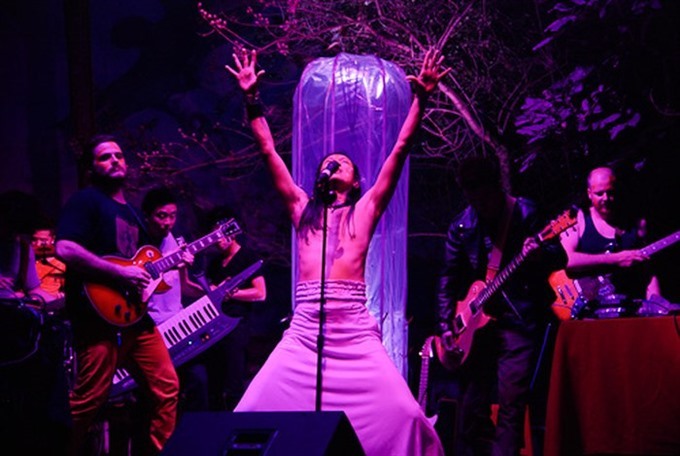 HÀ NỘI — Contemporary artist Đào Anh Khánh’s biggest performance will take place on March 23. Đáo Xuân Chín (The ninth edition of Upcoming Spring series) will gather 250 artists from 15 countries. Some of them have performed before in Việt Nam such as sound artist Kazehito Seki (Japan) and musician Nikola H Mounoud (Switzerland). They will perform dance, music, installation art, body painting, sculpture and other types of art across seven stages in the Gầm Trời Valley, in the northern province of Hòa Bình. Khánh said the show will be more special than ever due to the large number of participating artists. Each one will offer extraordinary performances for the audiences, he said. “I have organised the Đáo Xuân series for nearly 10 years, it will be a privilege to mark the end of this artistic event,” he said. Đào An Khánh is seen at the previous Đáo Xuân performance. With an area of 50ha, Gầm Trời Valley is an ideal place for tens of thousands of spectators to come and enjoy all kinds of art. Khánh estimated that the event will receive 40,000 audiences. The entrance is free. He also arranges shuttle buses for audiences from Hà Nội to Hòa Bình and vice versa. Khánh promised that audiences will live life to the fullest with the art performances. It’s all about love, he said. Khánh has invested in the Gầm Trời Valley for 10 years. He sets up art spaces and sculptures here but always respects nature. He has the opinion that art and nature should be in harmony.